The Customize Windows > Computer and Internet > Cloud Computing > Why Companies Opt For Cloud Migration? Why Companies Opt For Cloud Migration? Why Companies Opt For Cloud Migration? 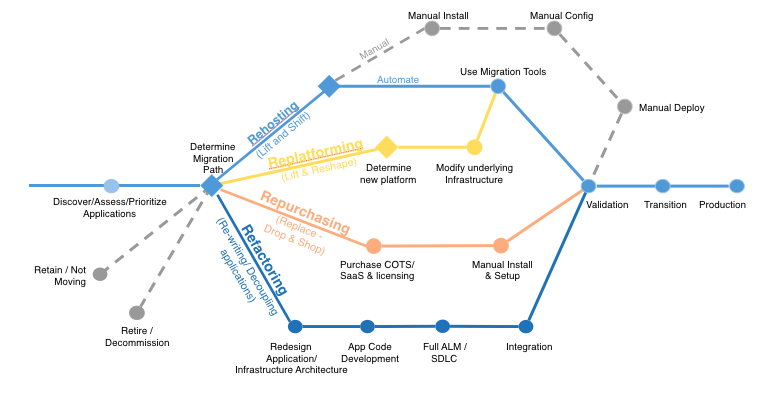 How do companies go about migrating all or part of their IT to the cloud? What they hope for, what they worry about? From migration to the cloud, CIOs, IT leaders, and other IT-related decision-makers expect first and foremost better performance from their existing IT. They are also increasingly interested in innovations that go beyond that. The potential benefits of migrating to the cloud are rarely disputed. Almost all studies show that the participants are very satisfied or rather satisfied with the cloud migration projects their company has operated so far. Over 90 percent CIOs think that the projects they are working will bring concrete benefits to their business. In every fourth case, this benefit occurred immediately. Companies with higher IT budgets seen particularly to be satisfied. Some may judge about the projects in which they themselves have participated. However, this factor can not have led to any significant distortion, but the overall assessment from various studies is good. Not many participants exclude the added value of cloud migration for the future. From successful individual projects, the participants conclude with a clear, but not overwhelming majority on a high value of the cloud in general. They already consider Cloud Migration or, in two or three years and consider it a topic of very high or high relevance. About thirty percent companies responds in various studies that their company already has a cloud migration strategy or is working recently on it, another thirty percentage quote that they are going to start soon or just putting the team together. The more employees the company has and the higher its IT budget, the sooner it will follow an elaborate migration strategy. Responsibility for the cloud migration strategy is agreed by the most. Many therefore understand the cloud strategy as part of the IT strategy or at least as closely related to it. At the same time, it is considered a comprehensive approach that should have an impact throughout the company. The IT departments are seen with a comprehensive approach rather as a driver of cloud migration than the departments with their individual solutions. Their strategy seems to be: if cloud, then everywhere. The primary goal of the cloud is to solve issues that have existed since IT started: from “less downtime” to more security and ease-of-use, or “governance” on control options. The desire to reduce costs by saving time, speeding up processes or maintenance is also primarily about improving the existing system, not about new business models or other innovations. It’s no wonder, as cloud migration is usually driven by decision-makers who are responsible for the smooth functioning of IT and often for their profitability. The five most frequently mentioned challenges: data security, data protection, security, operational security and, in fourth place, missing employees and skills also a concern for ongoing operations by many companies. The solution seems to be on the doorstep: most of the CIOs think that the cloud is safe if the data stays in safe country. If security and costs are fine, many are also interested in how they can use cloud migration to initiate far-reaching innovations and new business models. Most prefer the privacy shielded private cloud, not only because it is the most secure cloud use, but also because it offers the best technical space for enterprise-specific innovation. CIOs, IT leaders are interested in data-lake approaches because they are designed to enable more in-depth analysis than traditional data warehouses and an agile approach. That they are more demanding to use, would be accepted. Especially large companies with a high IT budget operate analytics systems and important lines of business solutions, such as sales and human resources in the cloud. How they migrate? The most popular is lift-and-shift, i.e. the unchanged adoption of existing applications in the cloud. This is the fastest, safest and fastest profitable way to migrate on cloud. After all, near half thinks that their company also uses cloud migration to a great extent to modernize legacy applications. This Article Has Been Shared 241 Times! Articles Related to Why Companies Opt For Cloud Migration? Cloud Services are provided by different service providers. SaaS, PaaS are some levels of Cloud Computing. Here is a list of some commonly used Cloud Services. OpenStack Swift GUI Tools, in Other Words; OpenStack Swift GUI Clients are Rare Species, Here are Some Free/Open Source Python Based Tools. NASA is a Contributor of OpenStack. All Government Space Agencies Use Normal UNIX, Normal Servers and Known Protocols. Rocket Science is Newton’s Third Law. Using Our Two Scripts, You Can Easily Zip Your Whole FTP and Upload to Any OpenStack Swift Storage Like that From HP Helion Cloud Without Doing SSH. OpenStack Magnum is a project that combines the other softwares on multi-tenant Cloud software OpenStack to provide Container as a Service. Title: Why Companies Opt For Cloud Migration? Cite this article as: Abhishek Ghosh, "Why Companies Opt For Cloud Migration?," in The Customize Windows, May 12, 2018, April 26, 2019, https://thecustomizewindows.com/2018/05/why-companies-opt-for-cloud-migration/.